For those that aren’t familiar with Ecoinomy, they are a behaviour company whose aim is to motivate employees to be less wasteful in the workplace. Their online system encourages behaviour change by creating communities of employees who are rewarded for saving money. Creating behaviour change takes time. It is not a matter of telling people to do something different or about removing items that encourages bad habits. It is about empowering people to feel they are making a difference that they benefit from. Making changes alone often feels pointless and goes unrecognised but making changes as a group where you can see a tangible difference can be incredibly motivating and rewarding especially if there is an element of competition involved. This is what Ecoinomy does! 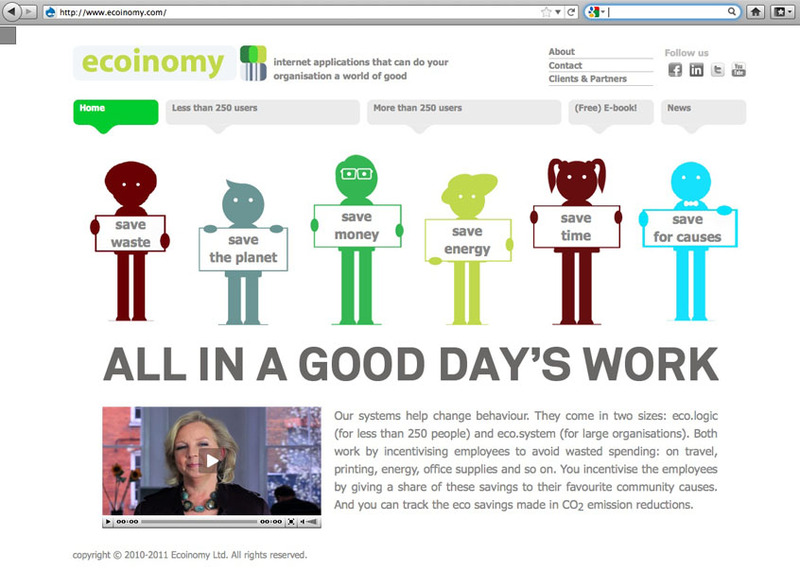 Ecoinomy has two offerings – the eco.system which is aimed at organisations who have more than 250 people who would use the system and eco.logic which is aimed at departments, project teams or companies with less than 250 people who would use it. Both work in a similar way – a cause (charity, community group, event etc) to save money for is agreed, people join the system and enter their cost savings into the system. A carbon calculator estimates the amount of CO2 saved and the money calculator adds up the money saved. A percentage of this money goes to the chosen cause. It’s a win, win, win situation – the company saves money by the employees consciously changing their habits (whether it’s reducing their printing, cycling to a meeting or not ordering biscuits for the next meeting), the employee sees a reason to think sustainably and feels motivated in the workplace and the environment wins because the CO2 emissions are reduced. Once momentum builds on the system and people see new ways to save money, the system becomes invaluable. There is also a free e.Book ‘Ecoinomics’ on the website which can be downloaded for tips on how to operate in a less wasteful way. The fun illustrations and novel examples are not only thought provoking but also obvious and easy to carry out! The fantastic thing about innovation like the Ecoinomy systems is that it creates interaction within the workplace and encourages employees to think further than the workplace. If workplaces can become less wasteful and attitudes changed by employees seeing how much money they can save for their company and cause, then the hope is that those messages will go back to the home and we can live on a happier planet.